More than 20 years ago, I traveled the Silk Road across China. I was stunned by the many exotic sights but the one that captured my heart was my visit to the Mogao cave temples, Buddhist Art on China’s Silk Road…unforgettable. Situated near the town of Dunhuang at the edge of the Gobi Desert in northwest China, 500 magnificently decorated Buddhist grottoes, have amazingly survived. Dating from the fourth to the fourteenth century, a limited number of the caves are regularly opened for public viewing. Filled with exquisite wall paintings and sculptures, the caves bear witness to the intense religious, artistic and cultural exchanges which took place along the Silk Road, the trade routes linking the East and West through the centuries. Now on display at the Getty Center, amazing full size replicas of three of these caves complete with statues, wall paintings and sculptures have been brilliantly recreated. At the Research Center, the exhibition continues featuring rooms filled with original objects including exqusite paintings and manuscripts. 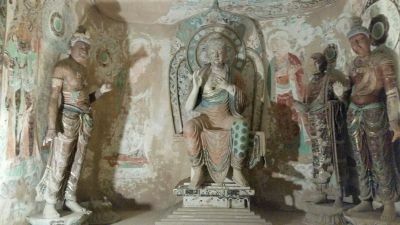 The extraordinary exhibition celebrates more than 25 years of collaboration between the Getty Conservation Institute and the Dunhuang Academy to preserve this UNESCO World Heritage Site. Not to be missed. On display through September 4, 2016.